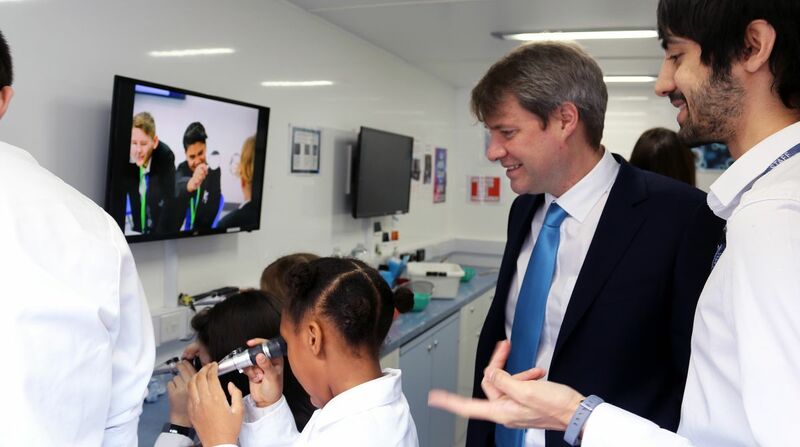 Universities Minister Chris Skidmore MP sees children from St John's C of E Primary School taking part in outreach work in Kingston University's mobile lab in a lorry. Universities Minister Chris Skidmore has commended Kingston University for its sector-leading work on social mobility, diversity and reducing the BME attainment gap. During a visit to the University's Penrhyn Road campus, the Kingswood MP was given a tour of facilities, including its dedicated STEM outreach centre, which hosts primary and secondary pupils for specially tailored sessions. He also met students including Rochelle Watson, who is the first in her family to go to university and was last year named one of the winners at the UpReach Student Social Mobility Awards. 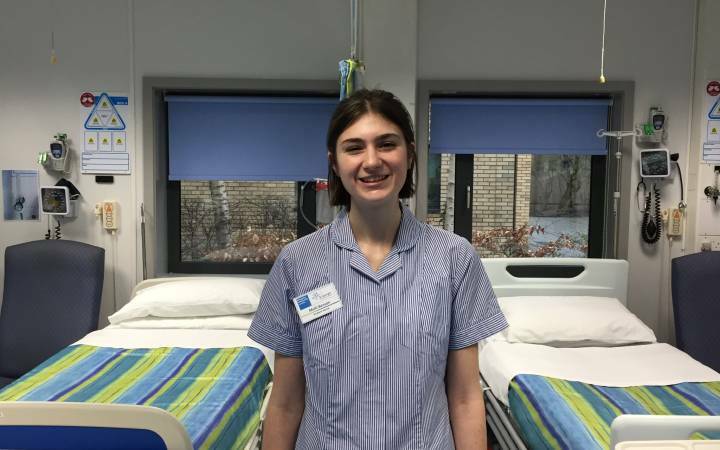 She shared her thoughts on the way university education can transform lives along with other students who have come through the University's KU Cares scheme, which supports care leavers and students estranged from their families. Mr Skidmore got a first-hand glimpse of advances in science education when he joined pupils from St John's C of E Primary School in Kingston, as they worked on experiments with the University's outreach team in its lab in a lorry. The mobile laboratories give school pupils a first taste of university life by bringing science, technology, engineering and mathematics subjects to life through a range of hands-on activities under the guidance of its outreach team. "The Minister had the opportunity to speak to students from a range of challenging backgrounds and learn how we've supported them to get a good education, succeed at Kingston University and get on in the world," Professor Spier said. "He experienced first-hand some of the fantastic outreach work we do with schools across London, seeing young people looking through a microscope in our lab in a lorry and opening up a whole world of opportunities to them. Vice-Chancellor Professor Steven Spier said the visit had provided an important opportunity to outline the benefits of raising young people's aspirations and widening access to higher education to Mr Skidmore, as well as emphasising the importance of having a diverse learning environment for all students. "Our discussions also gave me an opportunity to share some of the sector-leading work we do and the role we've been playing to nudge the Government to continue taking the issues of social inclusion, attainment for all and the value of diversity seriously." Mr Skidmore was visiting Kingston University for the first time since being appointed as Minister of State for Universities, Science, Research and Innovation, by the Prime Minister in December. After touring campus, he spoke of the importance of learning about how best practice in these areas was being implemented and how the Government could support it being taken forward by institutions across the country. 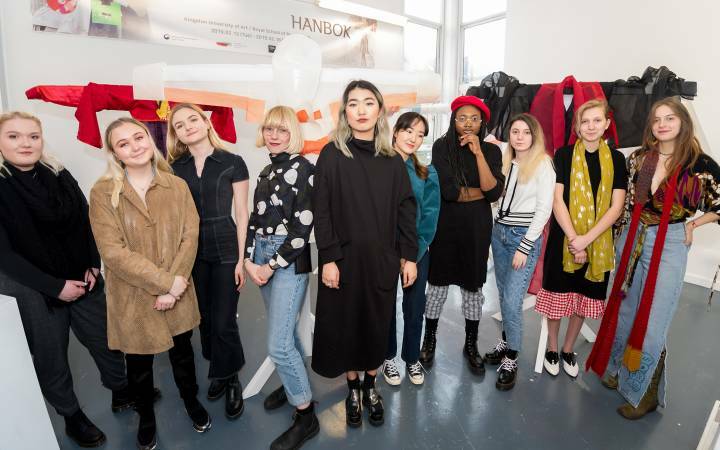 "I've come to Kingston to look at some of the excellent work the University has been doing around improving access and participation, particularly for black and ethnic minority communities, and also lowering attainment gaps as well," Mr Skidmore said. 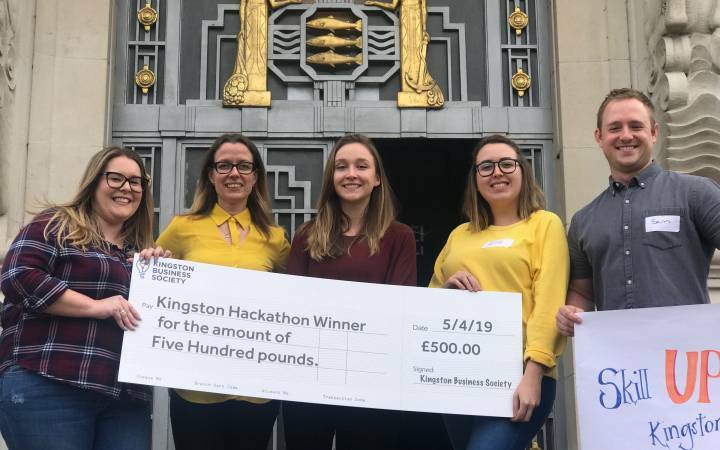 "For me, as Universities Minister, trying to expand some of the examples of best practice that I've seen here at Kingston is going to be really crucial. 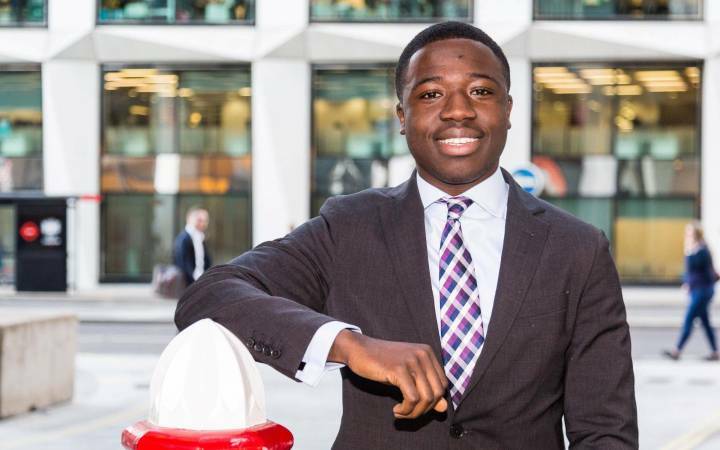 "Places like Kingston University that have clearly already recognised the need to make sure universities are reflective of modern society and modern Britain are where I want to draw inspiration from." Find out more about undergraduate and postgraduate study at Kingston University. FInd our more about the University's access and participation work. 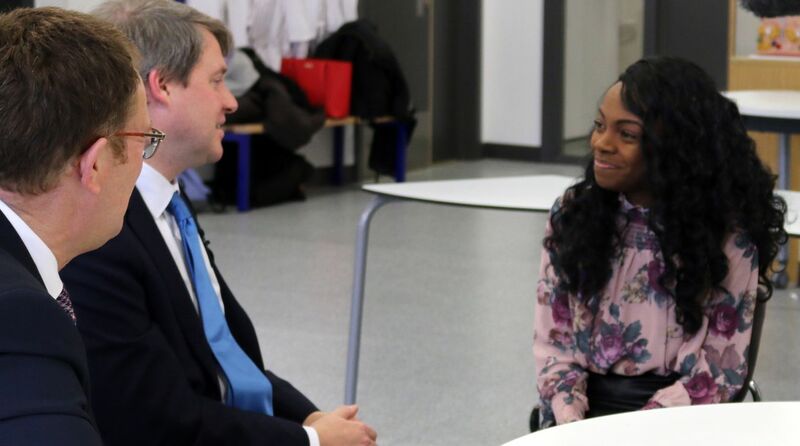 Universities Minister Chris Skidmore MP speaks with social work student Rochelle Watson and Vice-Chancellor Professor Steven Spier.